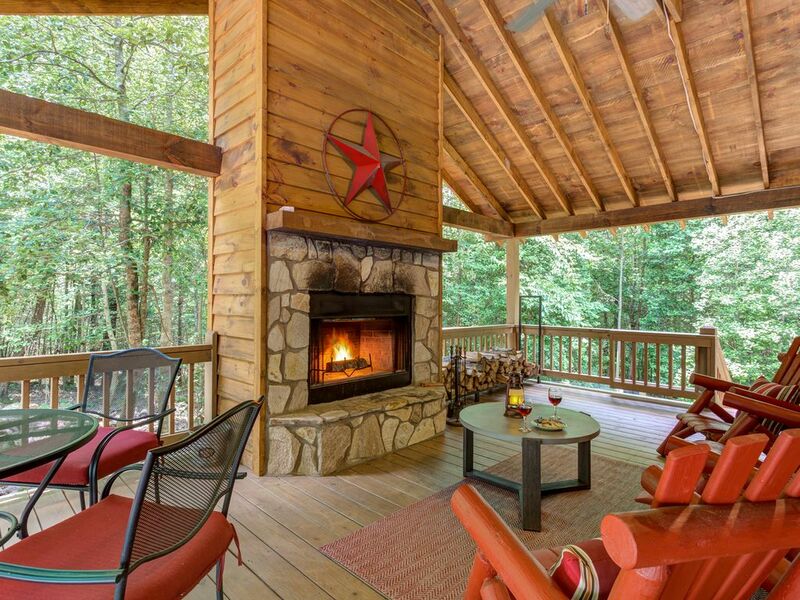 Leave your stress behind and retreat to the comfort of this cabin in Georgia's Blue Ridge mountains. Your family, friends, and beloved dogs will all find something to enjoy, whether it's the fresh air, modern perks, or abundance of activities. Five miles from downtown Blue Ridge, you're only a quick drive from meals at the Blue Ridge Brewery, but far enough that you'll be able to enjoy the deer and trees all around you. Your dogs will love the fresh air, and two are welcome to join you and enjoy the fenced backyard for a small nightly fee. Between hiking, fishing for trout, or exploring the trails on horseback, you're sure to make some memories. Soak in the hot tub on the deck or warm up by the outdoor fire on the covered porch. When you're ready to head inside, unwind in the classic cabin atmosphere while enjoying modern comforts like free WiFi and DVDs on the flatscreen. Between the grill and a fully equipped kitchen, you have everything you need to whip up something tasty. Save your dates now and start your next great Blue Ridge getaway! It's a nice relaxing cabin. Kept immaculat! Pretty secluded on a gravel road but not so far out that you can't make a run to the store if you forget something. My dogs enjoyed having a back yard to run around in. But be careful of the last step off the patio to the yard, it's a doozy. It was also nice to see wildlife every once in a while. We even saw a dear one night. I would stay again. My reason for giving it 4 stars instead of 5 is that there was a constant drip from the tub faucet that we could not get to stop. Woke up almost every night and decided to sleep on the couch just to avoid hearing it. We are sorry. Please call us next time so we can take the appropriate steps toward a resolution. This lovely mountain cabin was perfect. The outdoor fireplace and abundant wood provided endless hours of entertainment and relaxation. We also enjoyed the jacuzzi conveniently located on deck as well. There’re many hiking trails located off of the Aska Road (10 minutes away) that were amazing too; even made it to the Appalachian Trail Terminus to see all the hikers coming and going from a long journey. Very clean & comfy! The porches were the best! We enjoyed using the outdoor fireplace, and the cabin was perfect for our small family! Loved everything about this stay! Loved every minute of it! Had a great time. Loved the cabin.